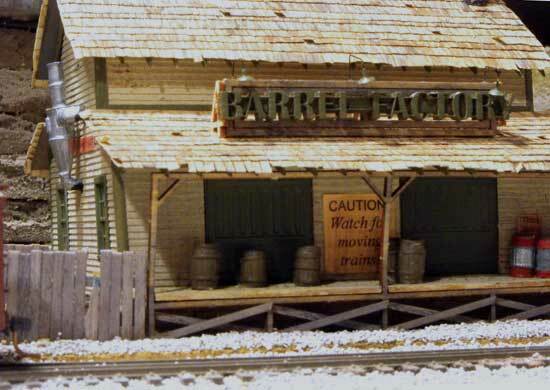 I have built a number of wood structure kits over the years by Campbell Scale Models, Fine Scale Miniatures, Kanamodels and others as well as scratchbuilt buildings. However, I had never tried any of the laser building kits. 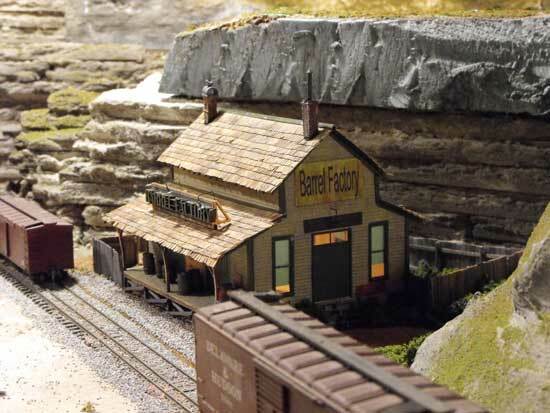 A local manufacturer in Ontario, Joe Rutter, owns a model structure company called Full Steam Ahead. His kits are for HO and O Scale. I've admired his work at regional model train shows. At a clinic he was giving I bought his HO Barrel Factory kit. I am not going to review the kit step-by-step, but I will make some general comments. Firstly, his instructions are very user-friendly and include photos at various steps. He includes a pamphlet of Weathering Tips & Techniques in the kit. These tips are practically worth the cost of the kit! Laser building kits provide sharp crisp lines for many parts. This makes the parts easy to work with. What I particularly liked was the way Joe had notched the roofline to accept the rafter tails.Rafter tails can be a real pain to line up properly. I still had to cut them from the supplied strip wood, but the notches helped to space and keep them perpendicular. Joe has a number of clever ideas about how to construct kits. I took about a month to put this small factory together. It's not a rush job. I also installed a room divider to control sight lines and added one 12 volt bulb to light the interior. Here are some photos of the 'newly planted' Barrel Factory. There's still some scenery work to complete around the building. I mounted it as a scene on a piece of masonite cut to fit the area I had set aside for the factory. I'm happy I did because i was able to move the building intact to my new UNRR layout. 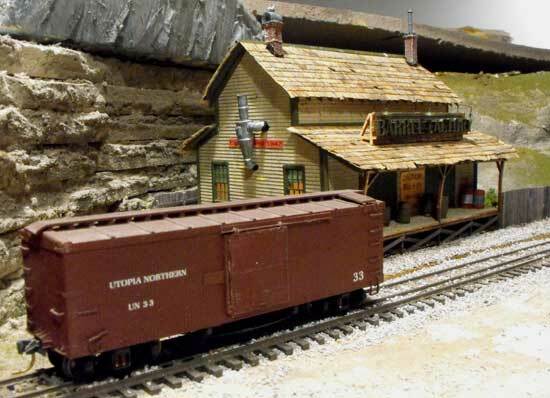 On my previous Utopia Northern HO model railroad the siding in front of the dock was dual-gauge, HO and HON3. In the photos a narrow gauge box car is on the track at one end of the factory and a standard gauge boxcar is at the other end. Have a look at some of Joe's laser building kits if you're looking for something a little different that's fun to build. He can be reached at joe@fullsteamahead.ca. Return from "laser-building-kits" to kit building overview. Go from laser-building-kits" to cardstock and paper sructures. Go from laser-building-kits" to Clever Models paper buildings. Go from laser-building-kits" to Scratchbuilding for beginners. 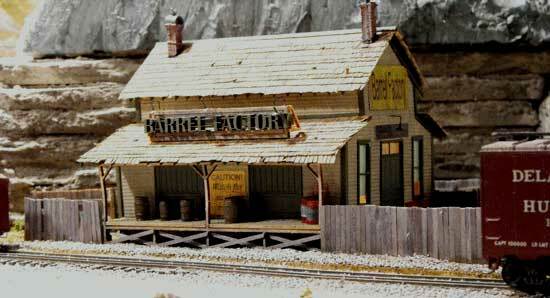 Go from laser-building-kits" to Campbell Scale Models freight house . Go from laser-building-kits" to How to build a rail barge (carfloat) . Go from laser-building-kits" to How to build a moveable barge . Go from "laser-building-kits" to my Home Page.